There is no shape or size limit for a website layout. However, over the years we have developed guidelines to assist our customers build customer appealing and functional websites. You can find three (3) important areas on all websites. These areas are classified as: (1) Top Content Block, (2) Body Content Block and (3) Bottom Content Block. 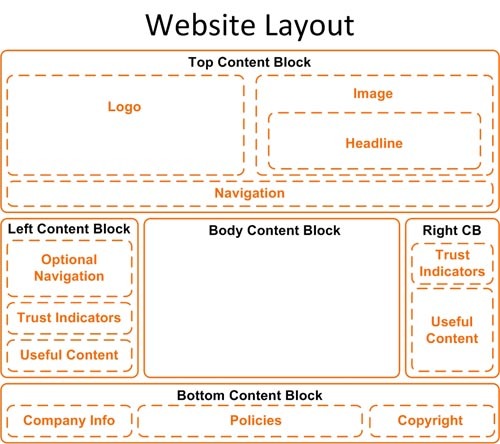 Each of these content blocks can include different elements for your customers. The body content block contains the specific details of each web page. The body content block can also include images, videos, products and any other information to assist for the customer. Optionally, the body content block can include additional content blocks. The optional content blocks can include sub-navigation, helpful content (links, social media, etc.) and trust indicators (references).